San Jose comes back from a late two-goal deficit to end Nashville's five-game winning streak. 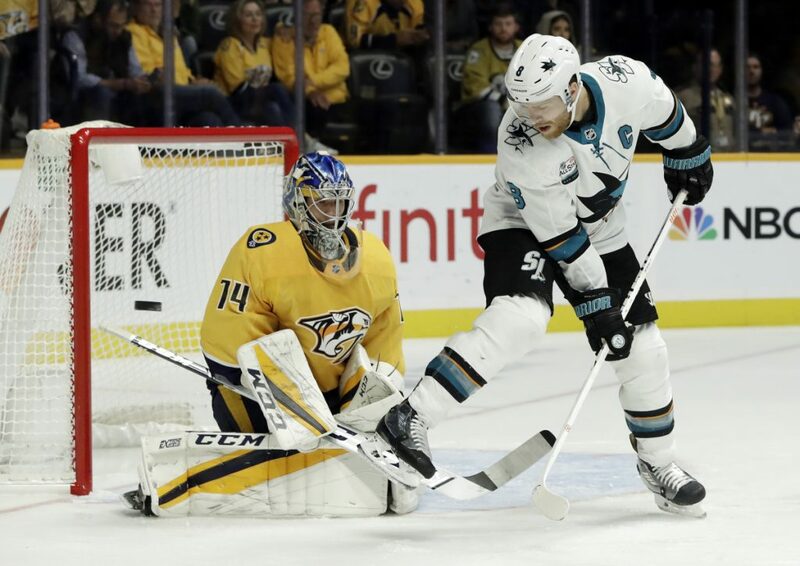 NASHVILLE, Tenn. — Brent Burns scored with 2:52 remaining to cap a rally from a late two-goal deficit, and the San Jose Sharks beat the Nashville Predators 5-4 on Tuesday night. The Sharks cooled off the NHL’s hottest team, ending the Predators’ five-game winning streak. Burns’ one-timer from the left circle beat Juuse Saros high to the glove side. Joe Pavelski tied it at 4 when he scored with 7:44 remaining after Brenden Dillon’s short-handed goal narrowed Nashville’s lead to 4-3 with 8:20 left. BLACKHAWKS 3, DUCKS 1: Patrick Kane scored in the third period, Corey Crawford made 24 saves and Chicago handed visiting Anaheim its their third straight loss. STARS 4, KINGS 2: Jason Spezza and John Klingberg each had a goal and an assist to help host Dallas snap a three-game losing streak. RANGERS 5, PANTHERS 2: Mats Zuccarello and Mika Zibanejad each scored twice as host New York snapped a two-game losing streak. Kevin Hayes also scored, Neal Pionk added two assists and Alexandar Georgiev made 36 saves for New York, which collected its third win of the season. COYOTES 4, BLUE JACKETS 1: Christian Fischer got his first career hat trick, Darcy Kuemper stopped 35 shots and Arizona rallied to beat win at Columbus, Ohio. Fischer scored in all three periods to help the Coyotes beat Columbus for the first time in the last seven tries dating to 2015. Derek Stepan got the primary assist on all three. Dylan Strome also scored for Arizona as backup Kuemper got his first win of the season in two starts. CANADIENS 3, FLAMES 2: Jeff Petry and Jonathan Drouin each had a goal and an assist, leading host Montreal to its fourth win in five games. Brendan Gallagher also scored for the Canadiens, who have lost once in eight games this season..
DEVILS: The Devils placed defenseman Ben Lovejoy and forward Drew Stafford on injured reserve and recalled defenseman Eric Gryba and forward John Quenneville from AHL Binghamton. Lovejoy sustained a lower-body injury against Colorado on Thursday and missed Saturday’s game at Philadelphia. Drew Stafford sustained an upper-body injury in the loss to the Flyers. BLACKHAWKS: Goaltender Anton Forsberg was assigned to Rockford of the AHL after clearing waivers. The Blackhawks had been playing with three goaltenders on their roster since Corey Crawford was activated Thursday. Crawford missed the first part of the season after suffering a concussion last year.